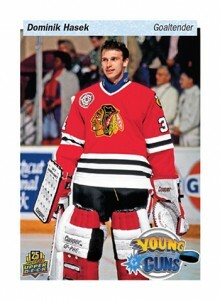 When it comes to Upper Deck hockey products, Young Guns have become a modern hobby icon. 2014 Upper Deck 25th Anniversary Young Guns Tribute Hockey helps mark a quarter century in the sport with an exclusive lineup of cards for the 2014 Toronto Fall Expo, which runs November 7-9. The set has three parts, each with its own set of cards. Collectors who make a qualifying purchase from a Certified Diamond Dealer at any point other than during specific Priority Signings times get 25th Anniversary Young Guns Tribute Rookie card. These are essentially "Young Guns That Never Were" for players who either started playing before Upper Deck got into hockey or slipped under the radar. Those who open a tin of 2013-14 Upper Deck The Cup at the company's booth also qualify. There are four specific times when collectors at the Fall Expo can get an exclusive Young Guns Tribute Priority Signings Autograph. To qualify, collectors must make the same qualifying purchase as the Young Guns Tribute Rookies and bring them to the Upper Deck booth at specified times. Collectors will then get an exclusive autograph or a piece of UDA autographed memorabilia. No 2014 Upper Deck Young Guns Tribute Priority Signings Autograph is numbered higher than 50. Supplies for each day are limited and available while supplies last. Collectors who buy an entire hobby case of 2014-15 Upper Deck Artifacts, 2013-14 SP Authentic or 2013-14 Ultimate Collection Hockey qualify for either a special Young Guns Tribute Priority Signings Autograph or an UDA autographed memorabilia redemption and a special premium item. All case breakers also receive an Upper Deck 25th Anniversary toque. None of the special black-bordered autographs are numbered higher than 5. Upper Deck has lots more planned for the 2014 Toronto Fall Expo, a lot of which is outlined on their blog. 2015-16 Upper Deck Young Guns Series 1 and 2 - You Pick!